Fake accents and false laughs are two things I hate in songs, and Peter Sarstedt’s 1969 number one hit Where Do you Go To (My Lovely), which contains both and makes it doubley worse for me, yet seems to appeal to so many people and made him a star in the sixties when it went to number one in 14 different countries and, additionally, earned him an Ivor Novello Award. Like his fellow chart toppers, Cliff Richard and Engelbert Humperdinck, in that decade, Peter was born in India where his parents were civil servants, but when his father died in 1954 the family moved to the UK and Peter learned to play bass guitar. His older brother Richard whilst at boarding school was inspired to move into music after hearing Bill Haley & His Comets’ (We’re Gonna) Rock Around The Clock and then decided to form his own skiffle group called the Fabulous 5. A few months later he invited Peter to join them on bass. In 1960, Richard went solo, changed his name to Eden Kane and had a UK number one the following year with Well I Ask You. In 1965 Eden emigrated to Australia and Peter was without a job, so he went to Copenhagen and started writing songs. He says, “The message I got from Bob Dylan was to be as unlike him as possible. A Dylan imitator is nothing like Bob Dylan because he would never imitate.”In so doing, Sarstedt came up with a highly original debut single, I Am a Cathedral. This cryptic song was arranged by Ian Green and produced by Ray Singer, who worked on his two 1969 albums, Peter Sarstedt and As Though It Were a Movie. It’s the story of a young girl born in poverty in Naples in Italy, who grows up to become a member of the jet-set. She wants to forget her past and he knows she goes back to her roots when she is alone. There were rumours at the time that it was written about Sophia Loren, who was herself bought up in the back streets of Naples. Among the personalities referenced are Zizi Jeanmarie, who was a French ballerina and cabaret star who in the 1950s and was reckoned to be the best dancer of her generation. It also refers to the Aga Khan, a wealthy Islamic leader who married the English fashion model Sarah Croker-Poole in 1969. The names Marlene Dietrich, Picasso, Sacha Distel and The Rolling Stones are also mentioned. Initially, his record company, United Artists, were not interested in releasing this as a single; Peter explained, “They said it has no drums, it is too long and there are only 3 instruments.” The label eventually relented and the song topped the UK charts for six weeks in 1969. When it did so, it became the first time two brothers had independently topped the UK chart. Seven years later, their younger brother, Clive, who decided to use the first name Robin, had his only hit with a cover of Hoagy Carmichael’s My Resistance Is Low and thus broke their own record by becoming the only time three brothers have had separate hits. Peter had one further hit with Frozen Orange Juice which reached number 10 in the summer of ’69. 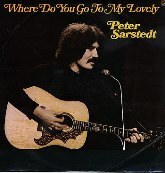 Where Do You Go To (My Lovely) has been parodied on different occasions by Roger McGough, John Otway and the Scottish-born stand-up comedian, Craig Ferguson. Peter often performs on oldies tours and he still performs on his own or with his brother, Clive, around Europe. “I reckon that I can pull in 250 people wherever I’m booked,” he says, “and that isn’t bad.” and because he generally does, he has the last ha-ha-ha-ha!